YES....I am sure. ARTHUR RANKIN and I had a discussion recently about my booklet in the MAD MONSTER PARTY DVD (Anchor Bay). JULES BASS picked the DVD up in the Fall of 2006 at BARNES & NOBLE and felt that the booklet had some errors. The DVD was originally issued in 2002 and luckily the 2005 Re-issue contains the same 24 page booklet. One question was if FRANK FRAZETTA really had anything to do with the films' poster art and ad art. YES...he definitely did! ARTHUR & JULES do not remember him. They know that the art was similar to JACK DAVIS' art in design and style BUT weren't sure who actually executed it. JACK did the character designs and an alternate poster design for the film. When I researched THE ENCHANTED WORLD OF RANKIN/BASS: A PORTFOLIO, I called Frank and talked with his wife Ellie, who confirmed he did the art. Later, ARNIE FENNER released a book called LEGACY (I HIGHLY RECOMMEND it! ), which unearthed this color piece and confirmed that his two black and white preliminary drawings were used as the final poster and design art for the film. Arnie and I also talked about the origin of the art. I believe that it was JOSEPH E. LEVINE that chose and paid for the art and not RANKIN/BASS. 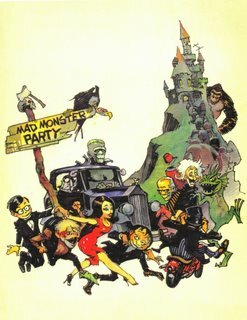 FRAZETTA was doing many "Jack Davis style" posters during this era and both did work for MAD MAGAZINE. Once JACK hit on his parade style one-sheet poster for IT'S A MAD, MAD, MAD, MAD WORLD, It started a trend in cartoon posters for the next decade that DAVIS and FRAZETTA split between them. In fact, Jack's first RANKIN/BASS work was the parade style poster for WILLY McBEAN & HIS MAGIC MACHINE (1965)! JULES is definitely correct about one error with the MMP DVD. On the back cover of the DVD, it states FORREST J. ACKERMAN (FAMOUS MONSTERS OF FILMLAND) assisted with the screeplay. He did not. ANCHOR BAY got this information from a movie database loaded with errors. I pointed out, that no research I did confirms his involvement in my booklet. In fact, I talked with LEN KOROBKIN (Writer of the screenplay) at length about it and he never worked with him. HARVEY KURTZMAN (Founder of MAD MAGAZINE) was brought into the project after LEN wrote the screenplay and added in some of his Kutzmanisms at the very end, such as the VEEBLEFETZERS that Felix had Mr. Cronkite buy for his Pharmacy. There you have it. The BEST RANKIN/BASS DVD released in 2006! THE ENCHANTED WORLD OF DANNY KAYE! Have a HAP HAP HAPPY NEW YEAR! I heard the bells on Christmas day! MERRY CHRISTMAS from SANTA & his ELF GIRL!